To mark a friend’s remains . . . Were he still alive, the Great Noggs would be thirty-two next week: unbelievable! Where have the years gone, when our lost friend has in so many ways remained alongside us all, referred to and deferred to, kept as close as close can be? One of our golden retriever friends recently lost his elder brother at the age of fifteen. It has been a telling time for him; he himself is only a couple of years old, so the mantle he must bear is huge and heavy. Our own Uncle Jonny was fourteen when he had to go. These are good ages for a biggish dog to notch up in good health and we must not complain. But the Great Noggs, whose mark has seemed indelible, missed his thirtenth birthday by a few weeks, which seems more than usually early really, but then he had had several nasty lumps removed over the years and finally his strong shoulders eventually gave way. Just the round twelve to show for it, then, but what a lifetime his was. Those who knew and loved him from his babyhood still speak in hushed tones of his heroic, even legendary life; the changes that he wrought in people’s hearts: such a big, soft dog, and yet so magisterial in his manner. 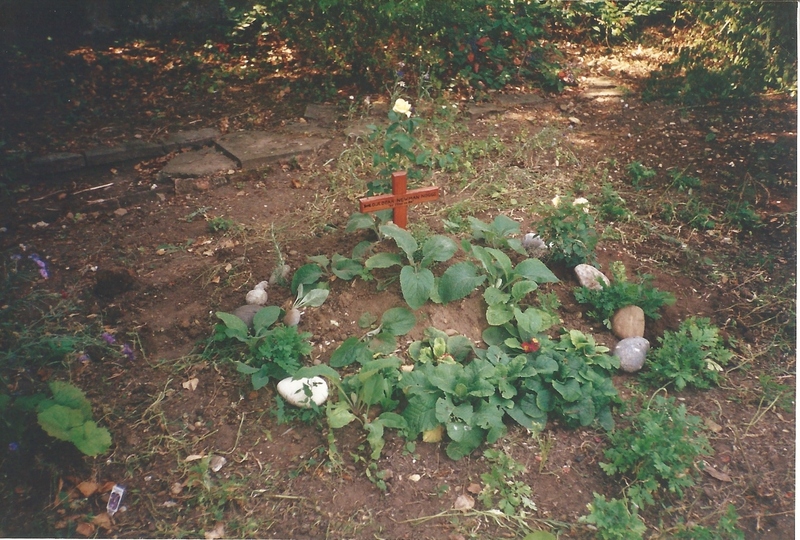 He lies to this day in a very distinguished grave in a very distinguished garden which is a part of history, a grave dug in the very depths of winter, in a wooded area awash with bluebells in spring. Pilgrims came to this spot to plant roses and herbs of memorial, so special was this beast. 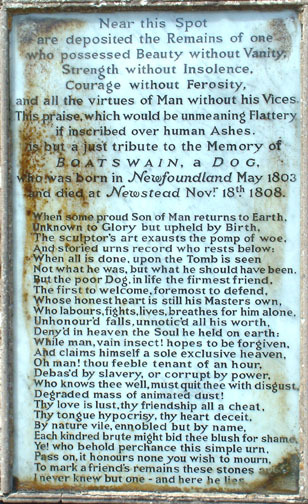 As Lord Byron reminds us in this splendid paean to his Newfoundland, the footprints that a loyal and loving dog leaves on us all too quickly sink into the sands of time, while man’s meretricious nonsense is memorialised. How wonderful that such a wordsmith should have shown himself so loyal and loving to our kind! Paradoxically, Byron gave immortality to Boatswain, who lived a brief five years. I cannot hear Byron’s epitaph without pondering on the likelihood that, by comparison, he would have considered his own fame quite unjustified: ‘all the virtues of man without his vices’, as he sums up the dog’s fine qualities. Such sensitivity and insight transcend any roguish reputation and place Lord Byron on a pedestal for all dogs and those who know and love us. You can well imagine that when he finished penning, ‘For we’ll go no more a roving’, it was to his gentle giant Boatswain that he clung thoughtfully, content to know the love that truly lasts and will never, ever, die. Thank you for your kind words. Pip.